The photo below was taken on Nov. 18 on a hillside that in late August was dusty, brown, apparently dead, but not grazed by cows. It is about a 2 by 3 foot area just below a sagebrush (not shown) in the Bannock Range south of Pocatello. 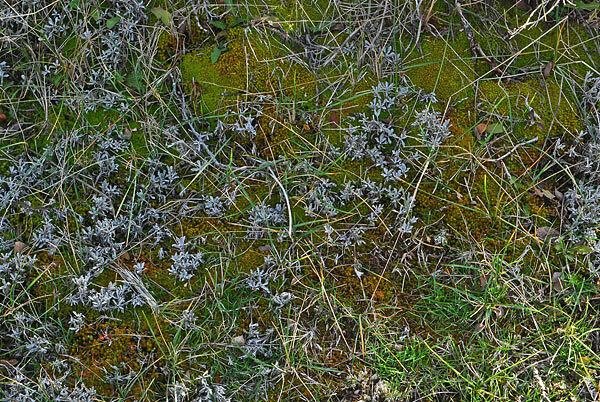 Where cattle have not destroyed the structure of the soil, cool weather and rain quickly brings an amazing proliferation of moss, lichens, and sprouting plants. Since the 18th there has been the first cold snap, and the area is probably frozen, but it will serve to collect and retain moisture, stop erosion, repel invaders like cheatgrass next spring and summer. No doubt by August 2008 it will again look dusty, brown and dead, perhaps not terribly different from cowed out country. Similar photos could have been taken under most sagebrush and bitterbrush plants on the hillside. Photo copyright Ralph Maughan. Nov. 18, 2007.
it’s incredible to think about the life of soil. one example: the conditions you describe above Ralph promote mychorrizae (a fungus). mychorrizae is attracted to carbohydrates (sugars) that are discharged into the soil by photosynthesizing plants. the filaments of this soil fungus extend into the root cells of plants and in exchange for their sugars provide a longer reach for the roots through the soil. the fungus brings back more water and makes available otherwise insoluble micronutrients that promote the vigor of the plant-life above. all contingent on soil structure which is tediously assembled as soil life moves through, slimes, and aggregates particles of soil making it both hold more water and more oxygen ~ it’s more loose which also makes it easier for roots to move deeper and further. these relationships and soil structures dramatically increase the vigor of plant-life above which in arid ecosystems is helpful to bolstering plants’ chances of making it through times of drought and hotter temperatures. soil life such as this can also make the difference between a seedling surviving a period of extended dry conditions and can dramatically increase the germination rate in natives ~ some are dependent on them. so when you look at a community of sagebrush, which engages in these relationships, and notice that the plants aren’t doing too well, you can look at the soil and usually see compaction or otherwise disturbed soils. over-utilization (plants munched too much or roughed up via heavy livestock) results in fewer leaves which means fewer sugars discharged into the soil ~ thus much of the soil life atrophies without nutrient. think of a 50% utilization rate ~ that’s roughly 50% less carbs in the soil for these soil organisms to do their thing and help all wildlife by way of helping plant-life through the times of stress ! pretty dynamic ! and it’s affected on either end ~ both when soil structure is trampled and compacted, and when the plant-life above is over-utilized and roughed up.